Whether you are a club or society or school or family or an individual, why not join the Bromley Town Twinning Association and enjoy the benefits of our partnership with Neuwied, our twin town on the Rhine in Germany and close to some of the most spectacular stretches of that river? You can be sure of a warm home from home in Neuwied, complete with red pillar box and red phone kiosk (now renovated as a mini street library). Our partner association is the Freundeskreis Neuwied Bromley and each year members of the two associations take turns to visit each other. You can choose whether to stay and enjoy the hospitality of a Neuwied home or stay in a hotel. If you would like to make an individual visit, we can advise.There are lots of events to go and see in Neuwied including the town's yearly carnival in July – the Deichstadtfest (Dyke Town Festival) so called because of the town's famous dyke to keep out the waters of the mighty Rhine in times of flood – and Rosenmontag (Rose Monday) the fantastic carnival day (Karneval) which Rhineland towns and cities hold on the Monday before the beginning of Lent (just before Shrove Tuesday and Ash Wednesday). While the town twinning is an official partnership of the two municipal authorities, the Bromley Town Twinning Association is a voluntary body separate from the council of the London Borough of Bromley and running under its own funding. That's not to say we are not close to the council and we work in a close relationship with them. 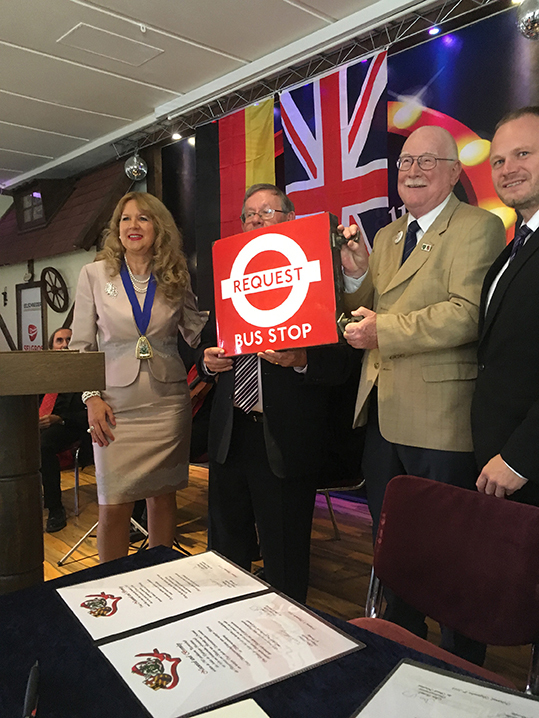 Each year the Mayor of Bromley is invited to visit his or her counterpart, the Oberbürgermeister of Neuwied. Both sides have learned a lot from each other over the years in the running of local community services. Click the Facebook logo below to access us.